Vital Ideas & Leadership supports high-impact initiatives in Toronto with a proven track record of success to achieve deeper impact and build capacity within the not-for-profit sector. These one-time strategic grants support organizations addressing quality of life issues in our city, as highlighted in Toronto’s Vital Signs Report and fund new strategic activities that will increase the effectiveness and sustainability of an initiative and position it for deeper impact. ACORN is a charitable organization that uses research and training to address the challenges in low-income communities. 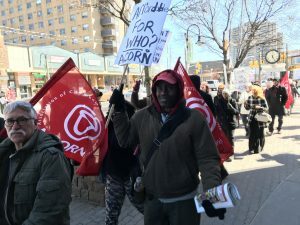 With this grant, ACORN will research and develop high impact trainings for Tenant Working Groups, to enable an organizational pivot towards affordable housing advocacy. This project is based out of the University of Manitoba and is a full and equal partnership between Indigenous and non-Indigenous people and brings together circles of ten individuals (five Indigenous and five non-Indigenous), that meet ten times, and are led by trained facilitators (one Indigenous facilitator and one non-Indigenous facilitator), in an effort to build relationships and understanding. With this grant, Circles for Reconciliation will expand their project into Toronto. SKETCH is a platform in the arts for diverse young people, navigating poverty, homelessness or on the margins, to fuel imagination, build creative capacity, and connect to opportunities to live well and lead social change. A Good Food Market at The Learning Enrichment Foundation. 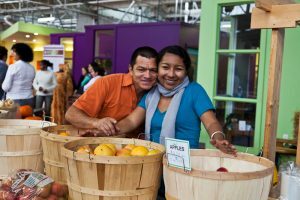 FoodShare works alongside Torontonians, throughout the city, to support them in animating community driven initiatives focused on helping to create more sustainable food systems. With this grant, FoodShare will strengthen and expand its Good Food Market program, which provides fresh vegetables and fruits at accessible prices in neighbourhoods with restricted access to affordable produce. LOFT (‘Leap Of Faith Together’) is the largest and most diverse supportive housing provider in Ontario. They offer specialized programs that target vulnerable and marginalized youth, adults, and seniors, with special focus on those with mental and physical health and substance use challenges. This grant will support LOFT’s BLOOM program, which is an innovative, ground breaking transitional gender housing program and networking group to meet the needs of the trans population in the GTA. Stella’s Place serves young adults aged 16-29 with complex mental health challenges, through a community that focuses on positive, peer-engaging, strength-based recovery. With this grant, Stella’s Place will enhance their peer-training program through the development of a Peer Support Training Guide and by expanding the Training Team’s capacity to deliver Stella’s Place Peer Support Training Program. Weston Frontlines Centre serves children and youth in one of the poorest ridings in Toronto and is the only local centre engaging youth in a variety of activities beyond the arts in Weston. They will be using the grant to run their Frontburners Youth Kitchen/Catering Careers program, which is an 8-week culinary/catering training program for youth in Northwest Toronto who face employment barriers.